Evolution and Diversity: BANANAS ARE IN DANGER! This banana probably looks very familiar to you. It should because “100 billion Cavendish bananas consumed annually worldwide,” and it is America’s number one choice of fruit. Many of us take this wonderful fruit for granted. However, we should enjoy them while they last, because there is a chance that the Cavendish banana population will be wiped out completely. This may be hard to believe, but this is actually not the first time that bananas have faced extinction. populations were wiped out by the Panama disease, which is caused by the Fusarium oxysporum fungus. Fortunately, for the last 50 + years the Big Mike has been replaced by the bananas that we find in our homes today. They are a Chinese variety called the Cavendish, that were able to resist the disease. However, the very popular, inexpensive, and delicious fruit, may not be around for much longer because in the last thirty years a new disease, called the Black Sigatoka has been wiping out bananas crops everywhere, and not only Cavendish bananas. Other types of bananas in Asia, Africa and Latin America have been affected by the disease. The disease is having a major impact on the banana industry. Banana crops are being cut in half, and farmers have to use more fungicides to try and fight of the disease. Farmers may have to”spray their plantations up to fifty times a year! (gmo-compass.org)” This is costly, harmful to the environment, and to the health of the employees that harvest the fruit. One serious issue is that the major use of fungicide is actually creating ‘super fungus.’ The fungus that is destroying the banana crops is at an advantage because it has a very short generation times, which allow them to adapt quickly, and create new generations of fungi that are resistant to the fungicide treatment. The Black Sigatoka is not the only thing threatening the banana population. It is actually a combination of things. 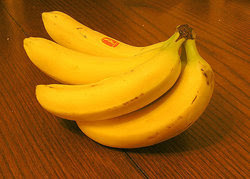 One huge contributor to the doom of bananas as we know them, is the fact that Cavendish bananas are pathenocarpic. So why is parthenocarpy a problem? Don’t be too quick to kiss the banana goodbye… there is still hope! With the useless effort to fight off fungus with fungicide, many banana producers are now hoping that genetic engineering can save the Cavendish bananas (and they might not be putting their bananas in the wrong basket). Many people have declared their love for bananas in song. One song that came out during a banana famine in 1923 was entitled, “Yes! We have no bananas.” Below is a link to a recreation of this 1923 hit, sung by the loveable Muppets. I remember this from a while ago, 2003 perhaps? As the Snopes article points out, the only banana's in danger are the industrial variety. Thus, organic Bananas with a wider diversity, could replace the Cavendish when they are wiped out. As the saying goes, whatever doesn't kill the species, makes it stronger.